Posted on Sat, Jan 14, 2012 : 11:03 a.m.
Photo by Heather Jane. Used with permission. One of the things I love about gardening is that the activity provides an outlet for discovering new ways to recycle and re-purpose the materials that flow through our lives. In our garden, we have used empty bottles to make cloches and yogurt containers for starting seeds. We used old windows to make cold frames. Small branches can become bramble for the peas to grow on, and twine has been re-used for squash and pumpkins to grow on. The compost is a constant reminder of our success at keeping yard and kitchen waste out of the garbage system and instead making a rich nutritious "food" to feed our plants. Last week a friend sent me a link that made my inner gardening recycler both giddy and inspired. The post on a "Cool thumb-controlled watering pot made with recycled materials" from the Fun in the Making blog is a nifty new idea inspired by pottery "thumb pots" in 17th and 18th century English gardens. 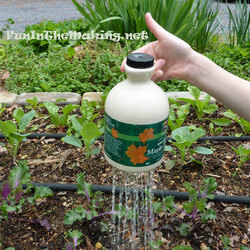 It's just the right tool for watering seedlings and delicate plants. This is the sort of simple and manageable project that would be great fun to do with kids. I will be making one as soon as I can. The thumb pot is a lesson for children and adults alike on fluids and pressure and the power of the thumb! Thanks to Cathy for the link! Mon, Jan 16, 2012 : 10:29 p.m. I love the idea and the fact that it's upcycled! It's just too small for me personally; I always need bigger watering cans, indoors and out. How do you use it?